Market research has been done for many decades, but it has failed to deliver better products. Take Google Wave, MyFord Touch or Walmart store re-designs. Focus groups, surveys and other market research had indicated that they were what people wanted, but they all ended up failing (as described in the book "Customers Included" by Mark Hurst and Phil Terry). Product and technology companies must think about it more as an experience continuum. Every touchpoint in an experience matters, even the ones that are controlled by others . If you’re not thinking about your customers engaging with you in a meaningful way at every single touchpoint that you and others could provide, then you run the risk of alienating them. If you can develop empathy for your customers, it creates a foundation for forming meaningful, lasting and emotionally-rich experiences. Empathy for the customer or user directly ties into what I call the Experience of Things. While there’s a lot of buzz lately around the Internet of Things, I think that term is incorrect. When we talk about empathy and our connected experiences, we’re talking about something much larger than an Internet of Things. It’s really the Experience of Things -- everything that we use and interact with in our daily lives is starting to build a computing mesh around us. Consider why the term Internet of Things came into existence. It was using the power of our connected computing --- essentially, the Internet --- to connect to individual aspects of our lives. I think that’s where this misunderstanding comes from. It’s not about the protocol; it’s actually about the connected mesh of nodes, delivering intelligence based on data points that our electronics and we humans are providing. For now, the Experience of Things is still in its infancy. Over the next five years and longer, the real power will come at the enterprise level, as larger organizations with many ‘‘moving parts’’ tap into that collective data and behavioral aspects of our now completely mobile society --- and, by the way, the enterprise is calling it the Industrial Internet. Even five years from now, I believe there are going to be many large companies that are not ‘‘getting it.’’ Companies that are on the cutting edge, however, with a healthy ratio of experience professionals, will be successful. In turn, the more successful they become, the more pressure it will create for other companies to adopt Experience Thinking. For some, it will be too late. Even now, some organizations are experiencing slow deaths. They are so compartmentalized in their own businesses that no one is centrally thinking holistically across the entire customer journey and all its touchpoints. In fact, I think the term ‘‘user experience’’ needs to evolve into just ‘‘experience.’’ I think the term ‘‘design thinking’’ is wrong, too; it needs to be ‘‘experience thinking,’’ encompassing customers, users and people who deliver products and surrounding services. 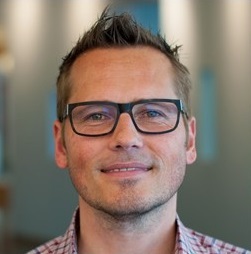 Peter Eckert (@petroid) is Co-Founder and Chief Experience Officer of projekt202. He is widely-regarded as one of the leading UI/UX design visionaries in the world. Peter has helped many Fortune 500 and leading-edge companies implement meaningful, user-centric software application design and development strategies.